It took about an hour for this pool of wax to form. The flame stayed small but mighty. The scent gradually floated about my bedroom. Eventually, I turned off the ceiling fan to it could gain some steam. Santiago Blackberry is truly a wonderous scent. I stick to my story of spiced blackberry sangria. This 7oz candle from Alamo Candelaria costs $10 and is housed in a bell jar from Spain made of recycled glass. Her Gypsy Jar is making eyes at me. That will be the next type of candle I try from Alamo Candelaria, now what scent? Hope everyone has a great day! I am dying to order from this company! Have you used any of the melts yet? I'm curious about their performance! I have! I used three so far and all three were medium to strong. My Chai, Mermaid and Belle Bohemienne. If you don't have any in the RR box I will send you some. To try :-) I am very happy with what I have tried. Such a gorgeous candle! I am very curious about this vendor, too. 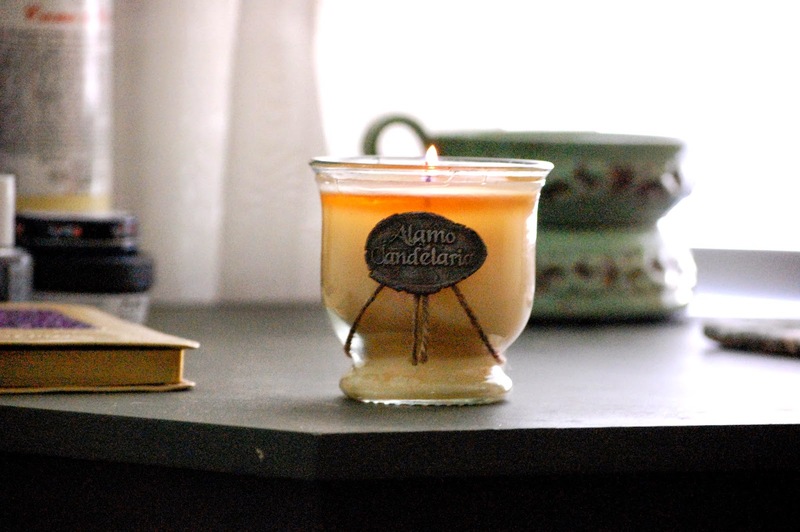 What scents do you have in mind for another candle?? Vanilla Dulce, Leatherosa, Blackberries and Cream all sound yummy to me! Pretty! I have been checking out the website and the scents are so unique! Definitely one for the future! She is fun to window shop. With her tarts coming in rolls of four it would be a fun vendor to swap for. Everyone pick one roll and then trade so that you could try new scents, kinda thing.